Flap, Flap, Flap, and Away! The game app Flappy Bird is definitely not a flop. In fact, it had been downloaded over 50 million times worldwide with about $50,000 earnings daily from game advertisements. So why did its creator Dong Nguyen remove it from app stores including the Google Play Store and iTunes last February 9, 2014? Simple, the game developer didn’t want fame and fortune to ruin his simple life. Vietnamese Nguyen had become an overnight sensation following the popularity of his simple game application Flappy Bird. The app’s premise is easy; a player just needs to guide the bird to safely evade each pipe by tapping the screen to keep the bird in flight. But it’s the same simplicity which was questioned by critics. Some argue that Nguyen ingenuity or lack thereof which had been targeted by experts in the game development industry may have challenged or offended Nguyen. Some sites had also reported about the game’s similarity with a French made app called Piou Piou as well as with Nintendo’s Super Mario Brothers series due to the green colored pipes. 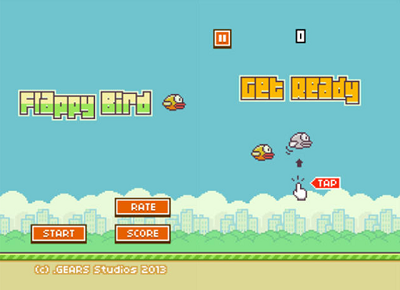 Flappy Bird’s developer could be possibly sued for intellectual property copyright infringement. Nguyen, however, denies legal issues and explained that he just wanted to keep his life simple as per his Twitter account tweets. The guy has a Wikipedia page now too by the way. 🙂 Furthermore, the developer is also looking into the possibility of developing a sequel to the most popular game this year by far. Released in May 2013, Flappy Bird had become a viral sensation throughout various social media portals like Facebook, Twitter, and YouTube. Even when it was removed from app stores, Twitter hash tags relating to the game had been trending. This addictive game left numerous mobile phone screens broken because despite the simplicity of the game’s mechanics, it’s quite challenging to maneuver the bird in flight in order to evade obstacles and prevent it from hitting the pipes or falling. Many had also resorted to selling their actual phone units with this app installed to interested parties since it’s no longer available for download. Several similar applications have also started to surface, hoping to replace this phenomenal game. And the last (but not recommended) option is to hack the APK in order to manually copy the game onto another device via a computer. Although Flappy Bird is no longer available for new users to download, it still remains a very popular game for existing players. RIP Flappy Bird, well, at least on the app stores but not on addicted players. This entry was posted in Apps, iOS, News and tagged flappy bird. Bookmark the permalink.